Michael Kimberly briefs and argues complex appeals and trial-court motions with primary focus on the antitrust laws, environmental law, and constitutional law. He has argued appeals in courts throughout the country, including twice in the United States Supreme Court, three times before the en banc courts of appeals, and numerous other times in the Second, Fourth, Sixth, Seventh, Eighth, and Ninth Circuits, and various state courts. In all, Michael has written and filed over 200 briefs in the Supreme Court and all 13 federal courts of appeals. Michael has been described by The Washington Post as a “seasoned Supreme Court practitioner” (2015), and according to Reuters (2014), he is among “a small cluster of specialists” and “the top handful of lawyers in America” who “dominate” the High Court docket. Michael was also recently recognized by Law360 (2016) as a top appellate advocate under 40, with “a yearslong track record of effective advocacy before the nation’s highest court.” Before that, Michael was profiled in The National Law Journal‘s 2015 Appellate Hot List for his for successes before the Supreme Court. Michael co-directs the Yale Law School Supreme Court Clinic, which represents civil rights, immigrant, and criminal defense litigants before the U.S. Supreme Court. This case involved a challenge to EPA’s Freedom-of-Information-Act release of detailed private information concerning family farmers and ranchers throughout the country. We filed a petition challenging EPA’s establishment of a federal regulatory scheme governing pollutant loading in the Chesapeake Bay watershed. 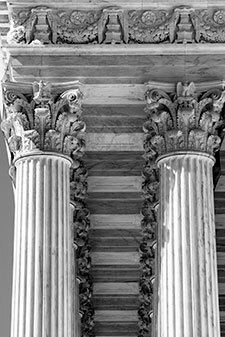 Appealing the partial dismissal of our client’s civil rights claims, we argue that the district court erred in allowing the defendants to belatedly raise a new affirmative defense and in holding that our client did not exhaust all administrative remedies. In this case, the Ninth Circuit held that every culvert and ditched that channeled rainwater runoff from forest roads was a discharge from a point source, requiring a Clean Water Act permit. We successfully challenged that holding before the Supreme Court. We prevailed in our defense of the Bank of New York Mellon’s historic $8.5 billion settlement resolving claims related to mortgage-backed securities originated and serviced by Countrywide. We filed an original petition for a writ of mandamus and habeas corpus in the Supreme Court on behalf of a federal prisoner seeking collateral relief from his sentence based on the Court’s decision in Johnson v. United States. The question presented in this appeal is whether a class of 1,166 employees may be entitled to an equitable remedy requiring Liberty Mutual to pay them pension benefits because Liberty Mutual failed to anticipate and clear up their misunderstanding of the terms of the plan when they were hired. We successfully persuaded a unanimous Supreme Court to reverse the Sixth Circuit and hold that challenges to the WOTUS Rule are properly brought in the district courts. We successfully defended a summary judgment in favor of CSX Transportation, Inc., persuading the Florida appellate court that when it comes to duties owed to trespassers on land, there is no distinction between the “active” and “passive” negligence of the landowner.